The new well is located, rather carelessly, beside the reservoir, which provides water for something like 150,00 people. The worry was that fluids would come all the way to the surface and fracking chemicals would get in the reservoir. Also, explosions or fires could occur at the older wells. 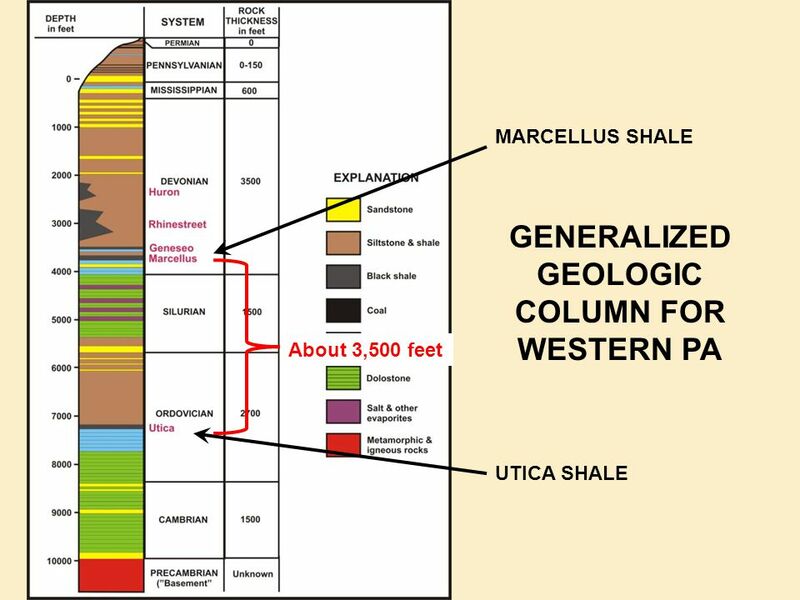 One of our group pointed out that the representations you see in publications show the shale layers like a wedding cake, uniform thickness, parallel and horizontal, which is not an accurate representation. 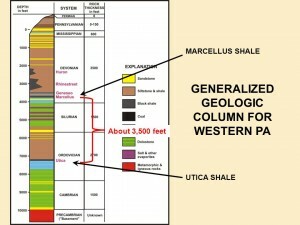 Shale layers are certainly not uniform and not without defects, fractures or fissures. The deposition of shale is what is described as “turbidites,” a mass of saturated clay mud slipping and slowly being washed down slope in quiet water, well below the surface of an inland sea. It is like a river delta, streams meandering and frequently changing course. This is occasionally being pushed out by slides of coarser sediment deposited nearer shore. This mud contains a few percent of organic matter from sea life, which decays without contact with oxygen to become oil and gas. The amount of oil and gas is so small and the shale so fine it cannot flow like conventional wells. Fracking breaks some of the shale to release 7% or less of the oil and/or gas present in the shale. Lots of irregularities are present, so the fracturing is not symetrical. One of us suggested the layer cake model was the result of the confusion between the executives who describe for the artists what they want. Another thought the confusion was between the geologists and the executives, since the executives are “doers” and don’t have much of an education in geology. Every effort is made to keep things simple in presenting information to the public, too. Probably there is enough blame for the misrepresentation to go around to all these sources. We agreed that ”communication” through the geologic layers is not new. That is, gas having enough pressure to penetrate horizontally (and perhaps vertically) outside the intended boundaries. I recalled discussion with friends in Doddridge County of how some conventional well owners were beneficiaries of fracking, it improved the production of their shallow wells! That was years ago and continues. Someone over there pointed out to me an abandoned old well that was frosted over from the fracked well gas that had leaked into it. We all knew that gas under pressure cooled when the pressure was relieved. In that case, enough to cause frost in summer, even. Others of our lunch group could tell related stories. Leaks from around casing not properly sealed is likely the cause of most leaks that destroy well and surface waters. Drillers are impatient to start after the cement is placed around the pipe designed to protect surface water, it costs them hundreds of dollars an hour to have an idle rig. So pressure comes on before the cement is fully set up. They have been known to supply clean water to people near their rig, acknowledging fault. It is usually stopped when the driller leaves the neighborhood, though. Excellent commentary. 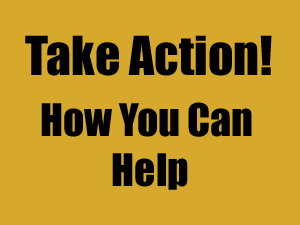 As a retired mining engineer, I have seen a number of instances where things that “should not have happened” in mines, did, indeed, happen because of geologic variances, nonconformities, fracture zones, subsidence areas, ancient stream channels, etc., that were not accounted for. In practice, such factors are extremely difficult accurately predict and account for. All one has to do is drive along any big road cut through rock and it is evident how quickly the geology/stratigraphy can change. The USGS had a symposium in 1994 (Link 2 to 1994 USGS Report) that discussed many of these issues. The O&G industry is aware of this publication and another 1954 USGS publication on deep well injection and earthquakes (Link 1 to 1951 USGS Report). Even though these reports demonstrated what could happen with deep well injection and fracking (a type of deep well injection), the O&G industry, like the cigarette industry did, is denying the cause and effect. Not only can/does natural gas migrate great distances, but fluids can, too. The Hutchinson, KS gas explosion in 2001 is but one example. There are many links/hits on this explosion (LINK). They are saying the problem was an unsatisfactory well casing job. That is consistent with the final paragraph above. The figures given in the Post-Gazette article are very favorable to the industry, however. This may not be an adequate explanation because CNX has not admitted that their casing lost gas containment permitting pressure release to a wide geographic area. This created an extremely dangerous situation for all the conventional wells affected. Anthony Ingraffea is perhaps the best-qualified person to comment on that. He is the Dwight C. Baum Professor of Engineering, Weiss Presidential Teaching Fellow at Cornell University. A professional Petroleum Engineer, he has been involved in study related to fracking since 1974, financed by National Science Foundation (NSF) through Schlumberger, Gas Research Institute, Sandia National Laboratories, and many more even the general reader would recognize.